Brooklyn rockers unveil the brand new 'Nine Types of Light' with stunning results. 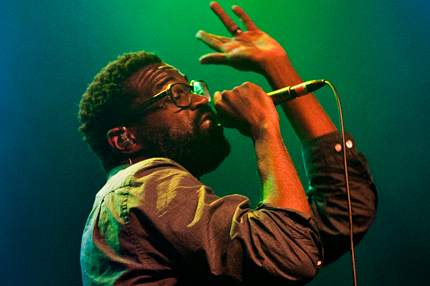 “We’ve never even rehearsed it before,” added lead singer Tunde Adebimpe. It was four songs into TV on the Radio’s rapturous, kinetic tour opener — “Young Liars,” “The Wrong Way,” and the aural cocaine of “Dancing Choose” opened it — and if they’d never rehearsed, you’d never know it. For that matter, you’d be hard pressed to believe the band — aside from a couple private gigs at this year’s SXSW (including one for SPIN) — hadn’t played live since wrapping an 18-month tour in support of the career-defining Dear Science and launching a short but deserved break. Check out more photos from this show on SPIN’s Facebook! Multi-instrumentalist/producer Dave Sitek moved from Williamsburg to Los Angeles, where he now records in Beverly Hills. Guitarist Kyp Malone pursued a solo endeavor, Rain Machine, as did Adebimpe. The band’s deal with British indie 4AD came to a close. And, most tragically, bassist Gerard Smith was diagnosed with lung cancer, forcing him to sit out the current tour. Despite this tension, though, Nine Types glistens with positivity. Like the album’s gooey first single, “Will Do,” it brims with tales of longing and love. The crowd this opening night was treated to a few more new tracks in the middle of the set before the megawatt intensity of “Staring at the Sun” set them ablaze. Another new one, “Repetition,” upped the energy all the more, with Adebimpe repeating a phrase — “My repetition, my repetition is this” — over and over atop a cacophonous swell, violently twisting his long graceful frame around the stage like a tornado. The crowd responded in kind. “Will Do” cooled things a bit, but not for long. As they kicked out the frenetic beats of their most dance-y song, 2006’s “Wolf Like Me,” the amped crowd on the second floor balcony began raining full cups of beer on those below, who were so enraptured with glee they didn’t seem to mind (or notice) one bit. And just like that, they came roaring back.